Two FBI agents - one guided by reason, and another by intuition - looking for missing people in Washington DC. Serial killer gets abducted, Jess gets vision of Antonio. A judge has her daughter kidnapped. The team hunt for a boy after he disappears while in his grandmother's care. Vicki Nelson, a former homicide detective turned private investigator, and Henry Fitzroy, a 470-year-old vampire, form a unique team solving cases and dealing with the supernatural world. A teenage girl is visited by God, disguised as everyday people, and is given assignments and tasks that eventually have a positive outcome on people's lives. Common sense. Sixth sense. Together they're the FBI's newest team. Jess Mastriani: We have a missing man. George Wright, 35 years old, six foot five, 190 pounds. He vanished from his hotel room where he was with a hot woman. FBI Agent Nicole Scott: A hot woman? Who said so, Antonio? Jess Mastriani: [shrugging] I just read 'em. FBI Agent Nicole Scott: Mmmm-hmmm. Jess Mastriani: I don't know what I'm supposed to do with this. I mean how am I going to connect to him off one photo on a PDA? 1-800-Missing was an imperfect but enjoyable show. Sadly, in a counter-productive attempt at helping the show, Lifetime ruined it. 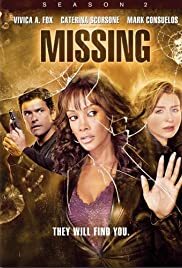 They ruined the look of the show by shooting it on video, giving it a barely-professional look and most importantly, they cast Vivica Fox. Vivica Fox ruins every scene she is in on that show. She is devoid of any discernible acting ability and grimaces her way through scenes. It's hard to imagine why they let an excellent actress like Gloria Reuben go, but to replace her with a bad actress like Ms. Fox shows that the show has now reached its creative death. Maybe it is now so cheap to do (it does look like amateur hour at the local theater!) that they are still shooting it, but really... is there anyone still watching it?